Are you looking at purchasing a pool? Well we have something for you to consider. Would you purchase a chlorine pool or a salt water pool? Well there are benefits to both. We are not experts on salt water pools so we've done some research to inform both ourselves and you! Some people enjoy the ocean so much that when they are on vacation at the beach, they barely go in the hotel pool! FYI : SALT WATER POOLS DO HAVE CHLORINE IN THEM. Salt water pools have less chlorine than a chlorinated pool but chlorine is still present. You do not add the chlorine by hand, though. It is created by chemical electrolysis within the salt water generator. Now, what we all are thinking...what about $$$. Initially, salt water pool owners spend more because a salt water generator can be pricey. You also need to keep it operating constantly so that costs money too. However, if you do your research, you can determine when the best times to run it are based on your pool size and the weather conditions. If you plan on having your salt water pool for a long time, it may be worth the initial increase in cost. 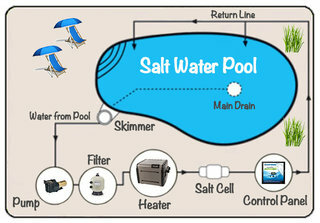 Salt water generators slow algae buildup AND produce correct amount of chlorine on their own. You only need to deep clean (drain, wash and refill) once a year. Some darker pools may acquire a salt ring so make sure you are installing the right liners and lights. In my opinion, salt water pools are interesting. I think they are better for the skin, cheaper in the long run and less maintenance. What does everyone else think?